← You Asked For Piecewise Functions, I Give You Piecewise Functions! A recent benchmark assessment in Algebra 1 I administered to our high school’s 1200 students in grades 9-11 provided some interesting data, as we prepared for the new “Keystone” Exams, which were given for the first time this past December. This question was given to over 1,100 students in a 20-question assessment, and only 14% gave the correct answer of B. Meanwhile, 66% gave the incorrect answer of A. So, what am I worried about here? And how can we use this result to improve our approach to domain and range our Algebra 1 courses? 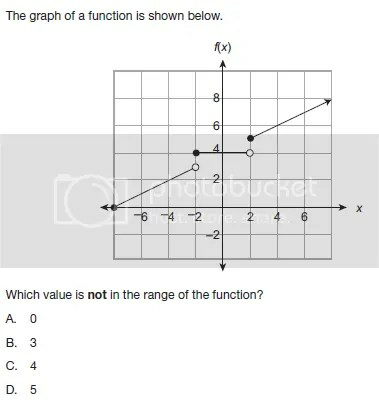 Do students understand how to express the possibilities of a function’s “output”? Have they been exposed sufficiently to the vocabulary which allows them to attach the word “domain” to the inputs and “range” to these outputs? Identify the domain or range of a relation (may be presented as ordered pairs, a graph, or a table). So, what’s the problem? One of the issues I see is that we deal with linear functions so heavily in algebra 1, it is easy for students to begin to believe that every function has “all real numbers” as the domain. Problems involving non-linear functions often provide natural “ins” for discussing domain and range, but we just don’t get to them until after domain and range have been defined, tested on, and forgotten. A second issue is that of coverage. Having students copy definitions into a notebook is simply not sufficient in order to “cover” domain and range. Students need to see experience the need to communicate domain and range, have a part in developing notation, and see the vocabulary reinforced appropriately in all math courses. 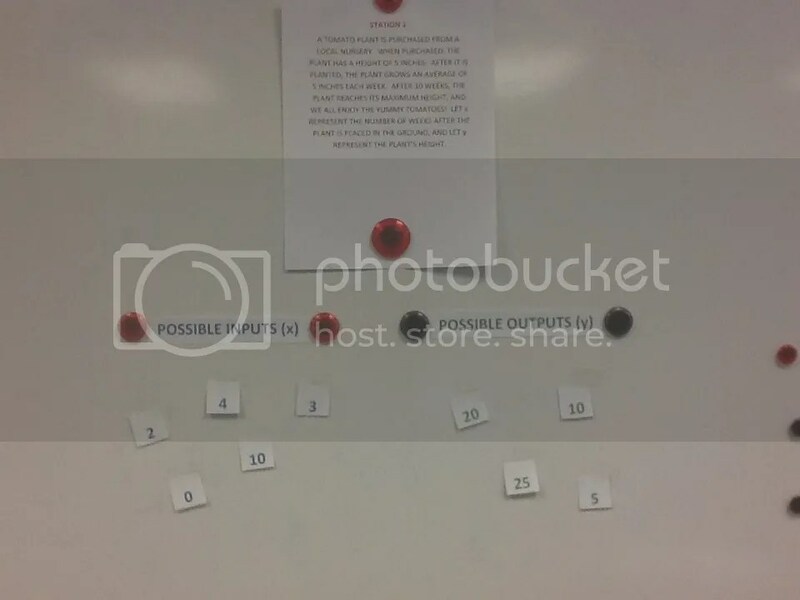 Here’s an station activity you can use with your classes to develop input/output sense. A tomato plant is purchased from a local nursery. When purchased, the plant had a height of 5 inches. After it is planted, the plant grows an average of 5 inches each week. After 10 weeks, the plant reaches its maximum height, and we all begin to enjoy the yummy tomatoes! Let x represent the number of weeks after the plant is placed in the ground, and let y represent the plant’s height. Next, provide each student (or pairs) with a few potential input and outputs, writing them on a 3×5 card. 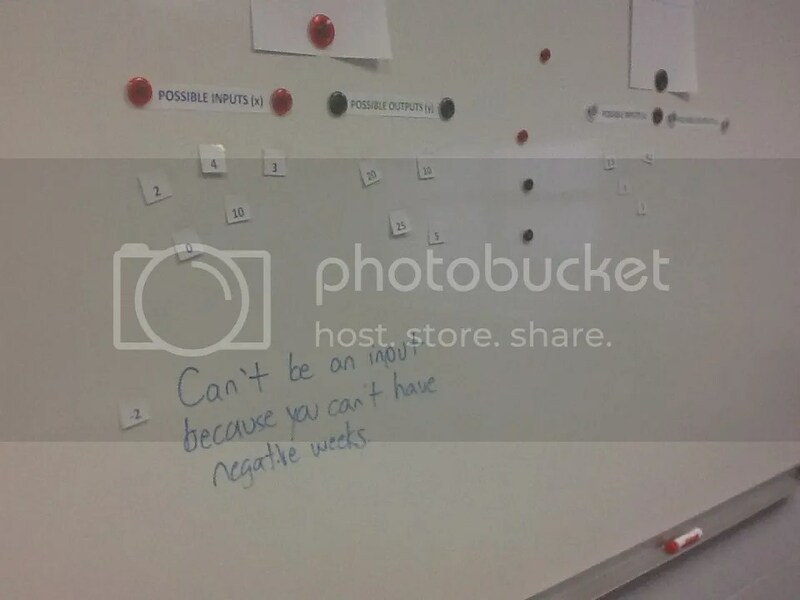 3 or 4 of each will suffice, and try to give a variety of positives and negatives, along with a fraction and/or decimal. Some samples are here. Have students visit each station, and list items from their card which are appropriate to the scenario. Soon, both lists begin to populate with inputs and outputs, for all of the stations around the room. When all students are satisfied that they have placed their values correctly, let’s add a twist. Assign each partnership a station, having them provide a value NOT appropriate to the problem along with a justification for their choice. Input values: x must be between 0 and 10, inclusive. No decimals. 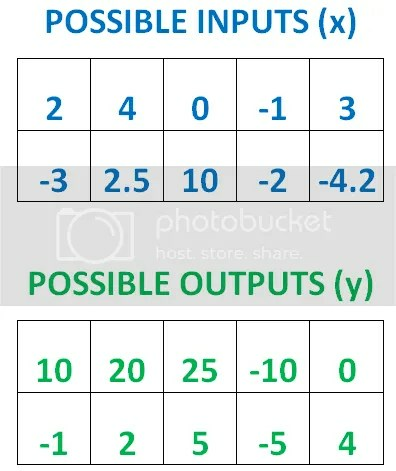 Output values: y must be between 5 and 55, inclusive. Now is the time to introduce our friends: domain and range. 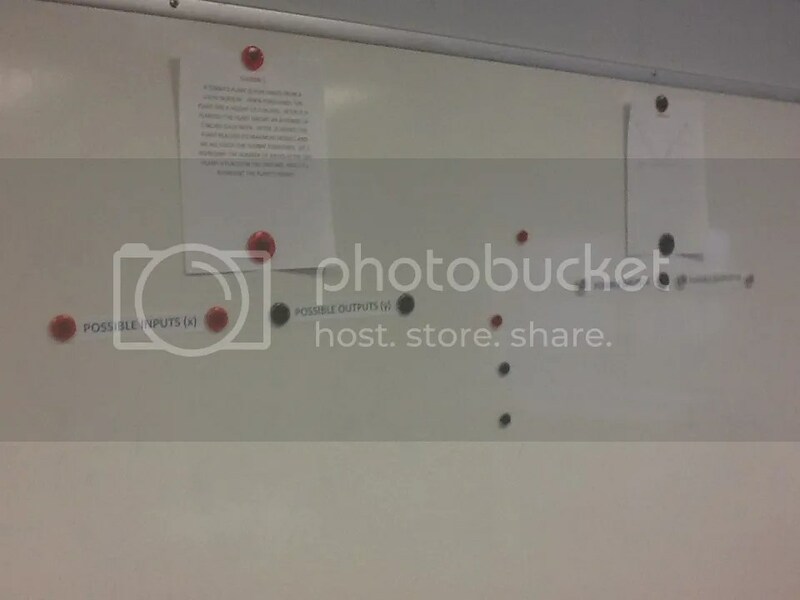 And, given the variety of problems we have seen on the board, we will have different means for communicating domain and range. Sometimes, all real numbers is appropriate, while other times the list is best given as an inequality. In other problems, a simple list may do. Do we need to restrict to integers? There’s no hurry to develop formal symbols for all of the stations right away. Perhaps complete one a day, and keep the ball rolling by providing problems which cause students to need to talk about restrictions. And finally, don’t limit discussion of domain and range to just the introduction to functions unit.